Better Call Saul confronts a series of hurdles in its first season. The first has to do with the low success rate of its specific lineage. Spinoffs have long been considered the lowest form of television entertainment. A position perhaps now occupied by reality shows, or, to be more precise spinoffs of reality shows. 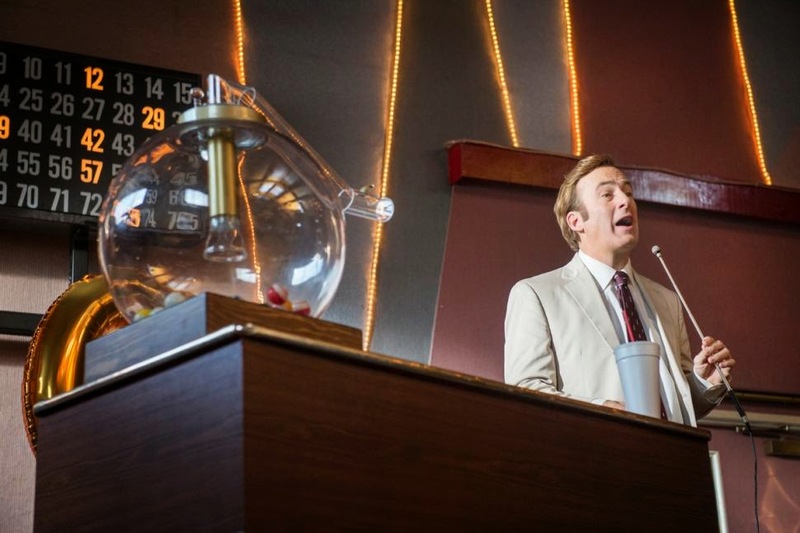 Better Call Saul stacks the odds against itself by combining the lowest form of television entertainment, the spinoff, with the lowest form of film, the prequel. While the spinoff is hated for its derivative nature prequels are not only derivative but deprived of at least the modicum of narrative uncertainty that would compel one to follow a plot. While viewers of Breaking Bad could be relatively certain that things would end badly for Walter White, there was at least the question of how he would meet his doom--cancer, Mexican Cartels, Hank Schrader, Jesse? Finding out how was half the fun. We know exactly how things will end for Saul Goodman. The first episode of Better Call Saul more or less doubles down on the certainty of its ending. 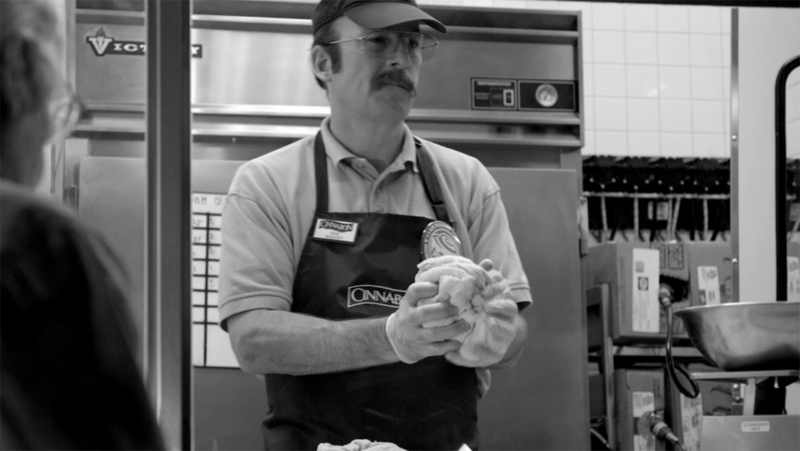 It opens with the fate that Saul feared for himself, his new identity as a Cinnabon manager in Omaha, making it clear that there are no surprises to come. The end point of the show is a certain as fate, as unavoidable as death. The only question is how we will get there. The show moves beyond this classic Hitchcockian definition of suspense through its introduction of an uncertain or at least undetermined present. When we meet Saul he is Jimmy McGill a struggling new lawyer. (That Jimmy/Saul's law degree did no guarantee him a job is both an accurate reflection of the current job market for law school graduates, and the show's particular way of capturing the collapsing middle class). The transformation of Jimmy to Saul that unfolds over the course of the show is doubled by another transformation given only in flashback. This is the transformation from Jimmy's previous life as Slippin' Jimmy, a midwestern conman to Jimmy McGill. Breaking Bad too was a show about transformation, about the process by which Walter White becomes Heisenberg. In each case we get a new name, a new look--Saul is to peach dress shirts what Heisenberg is to the porkpie hat--and a new man. Where they differ is just as instructive. Breaking Bad was very much the fantasy of the self made man--meth dealer as entrepreneur. In contrast to this Better Call Saul is about how one is made or unmade by one's conditions. Jimmy never sets out to become Saul. His plan is to become Jimmy McGill, Esq. an attorney, perhaps even partnered with his brother. The show makes it clear that he does not lack for talent and dedication and even a certain passion for justice. He is the one who uncovers the corruption at Sandpiper Crossing. However, a series of events, most notably his brother's longstanding distrust and eventual betrayal, make this transformation impossible. Saul is detour, a compensation for a dream deferred. 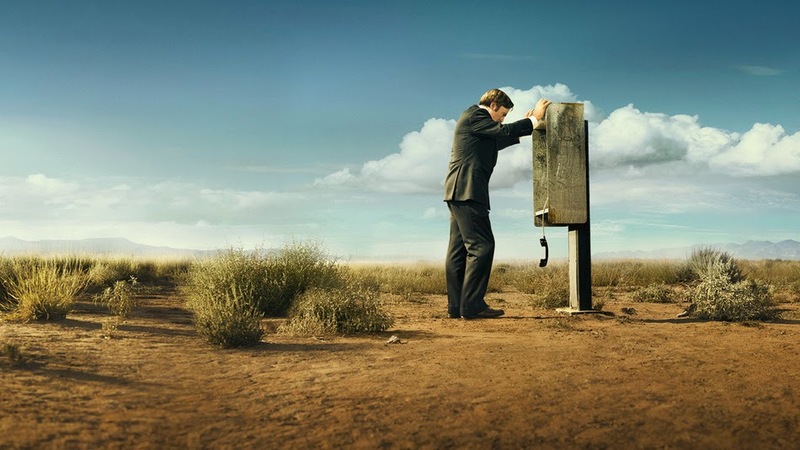 If Breaking Bad is a dark twist on the fantasy of being an entrepreneur, of becoming your own boss, Better Call Saul is an even darker look at the reality of being downsized, of being bought out and unmade. As much as the two shows can be opposed on the classic question of causes and effects, of changing oneself versus being changed by the world, they overlap on the question of change in general. As Jimmy's brother, Chuck says in the penultimate episode "People do not change." He rejects the transformation from Slippin' Jimmy to Jimmy McGill, insisting that Jimmy is still a conman at heart. In a similar fashion one could argue that Heisenberg was nothing other than Walter's rage and talent finally let loose. There are perhaps no changes, just revelations of what one is ordinarily forced to hide. The question of change the returns us to the very institutions in question. In the case of Breaking Bad, the drug trade proves itself to be not too different from running a fast food franchise, it is all about keeping labor costs cheap, a secret recipe, and brand identity. In a similar manner, lawyer and conman are not too distinct from each other in the conventional opinion, and Better Call Saul constantly exploits this zone of indiscernibility even extending it to include much of modern advertising. Jimmy's billboard stunt and Matlock suits (for the field of elder law) are not really scams. They are all parts of total branding, and total brand management. Advertisers, like con men, must necessarily manage their appearances. The season finale brings these different transformations together, filling in the dots of how Slippin' Jimmy became Jimmy McGill and bringing us one step closer to how Jimmy McGill became Saul. It does so through two different events. We learn of the prank, the little act of revenge that became a major crime, which required not only Chuck's help, but elicited his judgement. Chuck kept Jimmy out of jail and in turn he stopped being Slippin' Jimmy. We also see the act of defiance, of choice, that made Jimmy choose Saul over Jimmy McGill, Attorney at Law. After a brief taste of the fun and freedom of the conman life Jimmy decides that the struggle and work of becoming partner is not worth it. These two events, ten years apart, are not only brought together in the same episode, compressed by flashback, but are revealed to be not as far apart at as one might think. Brought together by the shows pivotal scene, Jimmy calling out a Bingo game. In that scene Jimmy gets increasingly frustrated at the odds as each ball is a "B." The odds are stacked, and plugging away begins to seem as senseless as having some effect over a random ball. What separates a life changing accident and a life altering decision is nothing but the attitude that one take towards it. The Bingo machine keeps senselessly spitting out balls, we only change the narrative.